The 1-4x28 SWAT-AR Rifle Scope by Barska has been specifically designed for accurate close to mid-range targeting with today's popular AR-style rifles. The 1-4x28 SWAT-AR utilizes the highly effective Mil-Dot Reticle, which can be used to quickly estimate range and elevation adjustments. This Illuminated Mil-Dot Reticle (IR) can also be illuminated to either red or green with adjustable brightness settings for accurate targeting in any lighting situation. 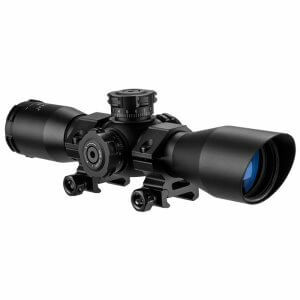 Fully Multicoated optics reduce glare and increase light transmission, giving the SWAT-AR 1-4x28 Rifle Scope impressive viewing clarity. The Barska 3-12x50 Level hunting and tactical scope is built and priced to be exactly what you need. With an advanced illuminated MOA reticle, top-of-the-line fully multicoated optics, and lockable turrets, the Level Rifle Scope is the precision instrument that endures and performs under any condition. Meet the new 1x30 HQ Red Dot from Barska, a versatile sight designed for split-second targeting and well equipped for any situation. An innovative auto-brightness setting allows the 1x30 HQ sight to automatically adjust the red dot brightness to better match the current lighting environment. Also included is a precision quick-release mount that will maintain a zero setting shot after shot. Meet the new 1x20 HQ Red Dot from Barska, a versatile sight designed for split-second targeting and well equipped for any situation. An innovative auto-brightness setting allows the 1x20 HQ sight to automatically adjust the red dot brightness to better match the current lighting environment. Also included is a precision quick-release mount that will maintain a zero setting shot after shot. The 3-9x42 Contour Rifle Scope with Accessory Rail by Barska is an advanced optical solution for close to mid-range targeting. Featuring a dual-color Mil-Dot Illuminated Reticle, the 3-9x42 Contour Scope can provide accurate targeting in any lighting situation. Switch between a red or green reticle and adjust the brightness to find the optimal reticle for your environment. 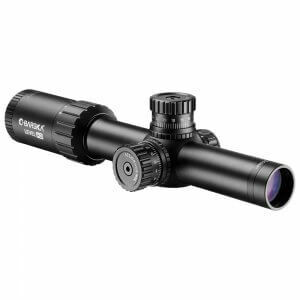 This Contour scope features a 1" main tube and fully multi-coated optics, and comes equipped with external locking windage and elevation knobs for quick and secure adjustments. 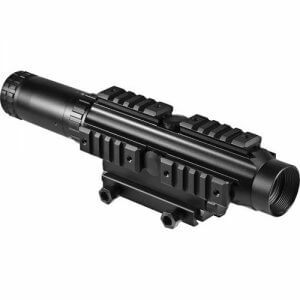 An additional Picatinny rail provides mounting space for a back-up optic and can be removed. The 3-9x42mm Contour Scope features a Picatinny-style base mount. 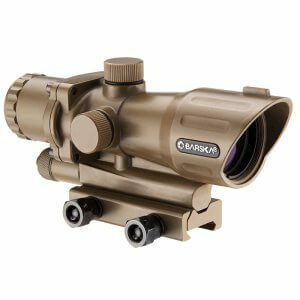 The 6-36x52 SWAT-AR Rifle Scope by Barska delivers high-powered performance at extreme distances shot after shot. 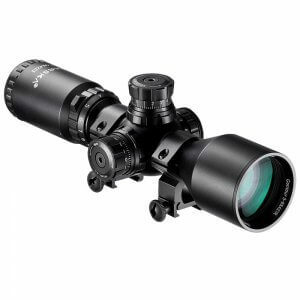 The powerful 6-36x zoom magnification allows the user to easily engage targets at distances of 500 yards or greater, while the fully multicoated lens and parallax adjustment help maintain a clear visual on the target at these ranges. The robust design of the 6-36x52 SWAT-AR Rifle Scope allows it to handle the repeating recoil from larger caliber rifle models, including popular .308, .30-06, and .50 BMG rifles. The 6-36x52 SWAT-AR utilizes an Illuminated Mil-Dot Reticle with adjustable brightness, which can be used to quickly estimate range and elevation. The 4x32 Contour from Barska is a compact rifle scope that offers maximum versatility and pairs great with both hunting rifles and modern sporting rifles such as the AR-15. An Illuminated Reticle (IR) in the Mil-Dot pattern can be switched between red or green illumination with adjustable brightness settings. The 4x32 Contour Scope comes equipped with a set of Picatinny/Weaver Style scope rings and external adjustable windage and elevation turrets. 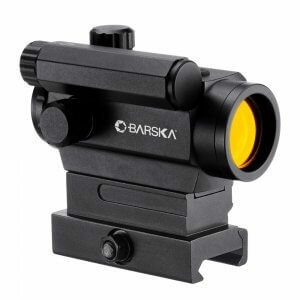 The Barska 4x32 AR-15 / M-16 Sight by Barska is the perfect sight for instant and accurate targeting. Features long eye relief for quick target acquisition. The scope's mil-dot reticle and windage and elevation adjustments helps you stay on target. 100% waterproof, fogproof, shockproof and can withstand the recoil of advanced compact firearms. Includes picatinny / weaver style base and M16/AR15 adapter mount. 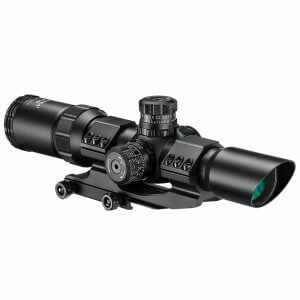 The 1-4x24 Level HD Rifle Scope by Barska is an advanced scope designed for accurate close to mid-range targeting with both hunting and tactical rifles. The 1-4x24 Level HD utilizes an HRS .223 bullet drop compensation (BDC) reticle, which can be used to quickly estimate range and elevation adjustments when shooting .223 ammunition. This Illuminated HRS Quick Shot Reticle (IR) can also be switched to either a red or green reticle with adjustable brightness settings for accurate targeting in any lighting situation with impressive viewing clarity. Scope rings sold separately. The Barska 4-16x50 Level hunting and tactical scope is built and priced to be exactly what you need. With an advanced illuminated MOA reticle, top-of-the-line fully multicoated optics, and lockable turrets, the 4-16x50mm Level Rifle Scope is the precision instrument that endures and performs under any condition. 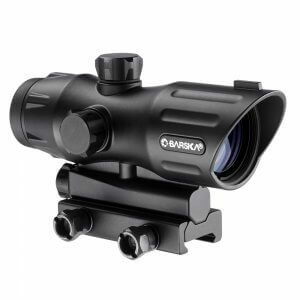 The Barska 6-24x56 Level hunting and tactical scope is built and priced to be exactly what you need. With an advanced illuminated MOA reticle, top-of-the-line fully multicoated optics, and lockable turrets, the 6-24x56mm Level Rifle Scope is the precision instrument that endures and performs under any condition. 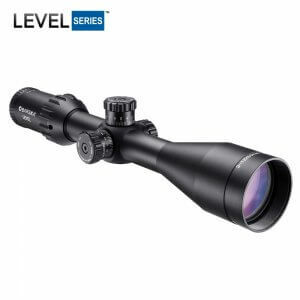 Give your rifle a huge boost in accuracy with the 1-6x24 Level HD Rifle Scope by Barska. The 1-6x24 Level HD scope features a First Focal Plane (FFP) Illuminated HRS MOA Reticle, which allows for accurate MOA measurements throughout all other magnifications for quick target acquisition. This Illuminated HRS MOA Reticle (IR) can also be switched to either a red or green reticle with adjustable brightness settings for accurate targeting in any lighting situation with impressive viewing clarity. The Barska 1.5-6x44 Level hunting and tactical scope is built and priced to be exactly what you need. With an advanced illuminated MOA reticle, top-of-the-line fully multicoated optics, and lockable turrets, the 1.5-6x44mm Level Rifle Scope is the precision instrument that endures and performs under any condition. 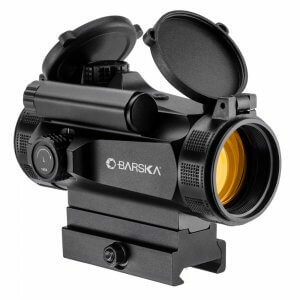 The 1x30 Red/Green Tactical Electosight by Barska has been developed for accurate close-quarter targeting, and is perfect for CQB environments. Unlimited eye relief and a 1x magnification allows for quick target acquisition, and the brightness of illuminated red or green dot reticle can be adjusted to fit any lighting situation. The 1x30 Tactical Electrosight by Barska is a perfect fit for AR-15 style rifles, and can work in conjunction with an existing Mil-Spec front sight. The 1x30 Red/Green Barska Scope is 100% waterproof, fogproof, and shockproof, and can withstand repeated recoil without losing zero. 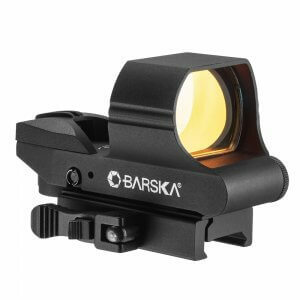 Experience targeting versatility with the 1x40 ION Reflex Sight from Barska. Four unique reticle patterns allow the user to modify the sight to their own preferences, and an integrated quick-release mount allows for fast attachment and detachment to any Picatinny/Weaver-style rail. 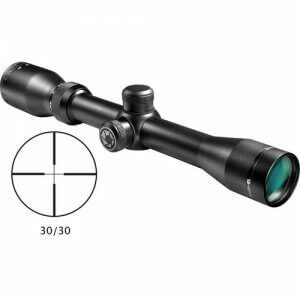 The 3-9x50 Huntmaster Riflescope from Barska is a perfect choice for serious shooters and hunters who are looking for the most essential features of a riflescope at a very affordable price. 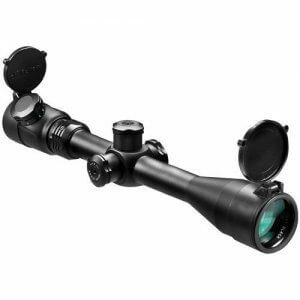 This Huntmaster Rifle Scope is great for general purpose hunting as well as target shooting and plinking. Parallax-free at 100 yards and fully coated optics makes this a high-value bang-for-the-buck riflescope. 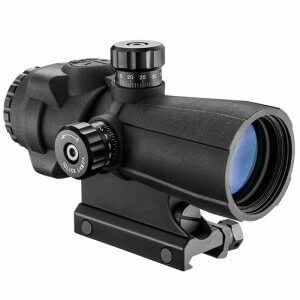 The Huntmaster offers a tough 1" single-tube construction with a 30/30 reticle, which provides high recoil capability. It features 1/4 MOA adjustments on the windage and elevation turrets. The 3-9x50 Huntmaster Rifle Scope features a black matte finish and includes scope caps and is backed by Barska's Limited Lifetime Warranty. 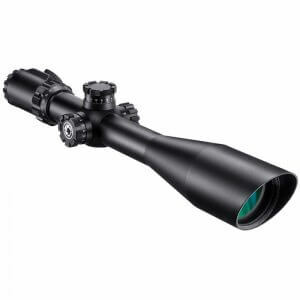 The 1.5-4.5x32 Hornet Riflescope from Barska is a perfect choice for shooters and hunters who are looking for the most essential features of a riflescope at a very affordable price. 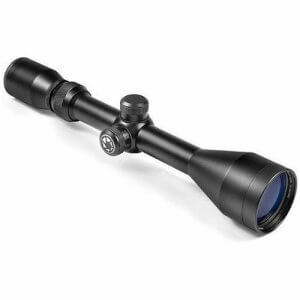 This Hornet Rifle Scope is great for general purpose hunting as well as target shooting and plinking. 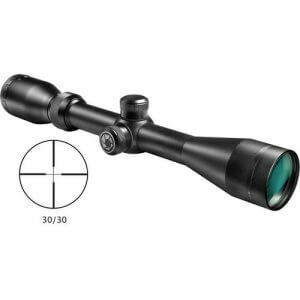 Parallax-free at 100 yards and fully coated optics makes this a high-value bang-for-the-buck riflescope. The Hornetffers a tough 1" single-tube construction with a 30/30. It features 1/4 MOA adjustments on the windage and elevation turrets. 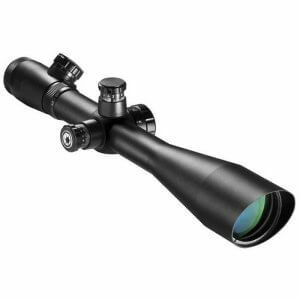 The 3-9x40 Hornet Riflescope from Barska is a perfect choice for shooters and hunters who are looking for the most essential features of a riflescope at a very affordable price. 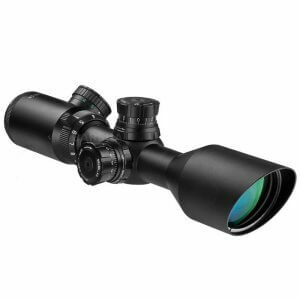 This Hornet Rifle Scope is great for general purpose hunting as well as target shooting and plinking. 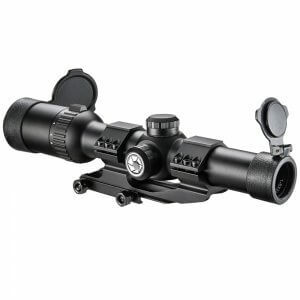 Parallax-free at 100 yards and fully coated optics makes this a high-value bang-for-the-buck riflescope. The Hornetffers a tough 1" single-tube construction with a 30/30. It features 1/4 MOA adjustments on the windage and elevation turrets. The 1-4x24 Electro Sight Tactical Multi Rail Riflescope from Barska is designed with the versatility in mind for both short-distance, quick acquisition and medium to long-distance shooting. The riflescope has been endowed with multiple Weaver style 7/8" Picatinny rails for attaching aiming accessories such as a laser sight or a flashlight. There are side and top rails, windage and elevation turrets, an adjustable rheostat and an illuminated Mil-Dot reticle. 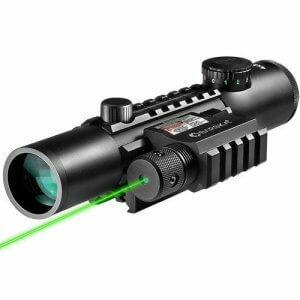 The 3x32mm AR-X Scope with Illuminated Reticle (IR) by Barska is a compact scope that's been designed specifically for the popular AR-15 platform. The innovative AR-X Mil-Dot Reticle can provide accurate targeting in low light conditions with illuminated red or green reticle color options and adjustable brightness settings. Removable Dual Picatinny rails, set at 45 degrees on the upper forward half of the scope, are perfect for attaching a reflex sight or light (sold separately). The 3x32 AR-X Tactical Scope delivers premium optical clarity with a multi-coated lens and is perfect for quick target acquisitions at close- to medium-range distances. The 3x30 AR-X PRO Prism Scope (Flat Dark Earth) by Barska is an innovative prism scope that was designed for law enforcement and military applications A tough rubber armor exterior helps protect the AR-X PRO from shock and external damage while a newly designed Illuminated Cross Dot Reticle allows for quick pin-point targeting. The color and brightness of the Cross Dot Reticle can be easily changed from red, green, or blue using a push-button design, which allows the user to quickly adapt the scope to the current lighting environment. The 3x30 AR-X PRO also features external 1/4 MOA windage and elevation knobs that can be quickly returned to zero. The 4x32 AR-15/M-16 Electro Sight (Flat Dark Earth) by Barska is a compact scope system that delivers 4x magnification with optimal clarity and performance. 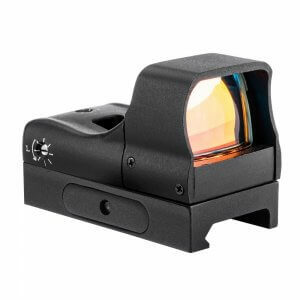 An Illuminated Red Target Dot Reticle allows the user to quickly engage their target even in low light environments, and is activated with the simple push of a button. The 4x32 AR-15/M-16 Sight is 100% waterproof, fogproof, and shockproof, ensuring long-lasting durability in any environment. The 1-6x32 SWAT-AR Rifle Scope by Barska has been specifically designed for accurate close to mid-range targeting with AR-style rifles. The 1-6x32 SWAT-AR utilizes the highly popular Mil-Dot Reticle, which can be used to quickly estimate range and elevation adjustments. This Illuminated Mil-Dot Reticle (IR) also features multiple brightness settings that can be easily adjusted by utilizing the buttons located near the ocular lens. Fully Multicoated optics and a built-in Sniper Edge sunshade help reduce glare and increase light transmission, giving the SWAT-AR 1-6x32 Rifle Scope impressive viewing clarity. External windage/elevation turrets assist the user in quickly zeroing in the SWAT-AR, and can then be locked into place to prevent any unintentional movement. 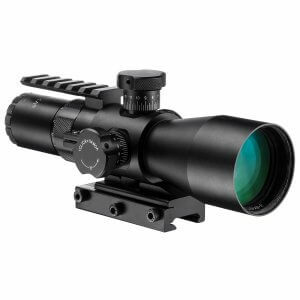 The 1-6x32 SWAT-AR Rifle Scope includes a 35mm cantilever ring mount, which makes the SWAT-AR ready for rail mounted use with any flat-top AR-style rifle. The 3-9x42 IR 2nd Generation Sniper Scope by Barska is a versatile tactical scope which will perform excellent in a variety of targeting situations. A built-in sniper edged sun-shade is set back in the housing, which allows the sun shade to reduce glare for use in bright sun. 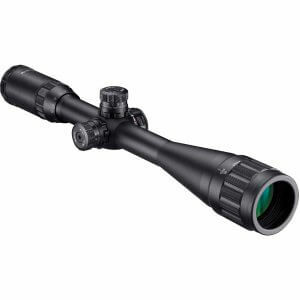 Multi-coated optics give the 3-9x42 Sniper Scope a sharp, bright image with excellent contrast. An illuminated red and green mil-dot reticle greatly enhances targeting in low-light situations with 5 levels of brightness, allowing the 3-9x42 Barska Sniper Scope to excell in any condition. 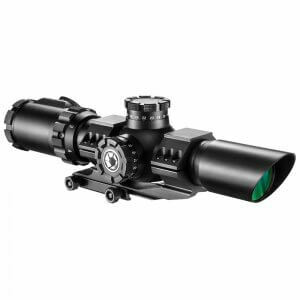 The 3x30 AR-X PRO Prism Scope (Black) by Barska is an innovative prism scope that was designed for law enforcement and military applications. A tough rubber armor exterior helps protect the AR-X PRO from shock and external damage while a newly designed Illuminated Cross Dot Reticle allows for quick pin-point targeting. The color and brightness of the Cross Dot Reticle can be easily changed from red, green, or blue using a push-button design, which allows the user to quickly adapt the scope to the current lighting environment. The 3x30 AR-X PRO also features external 1/4 MOA windage and elevation knobs that can be quickly returned to zero. 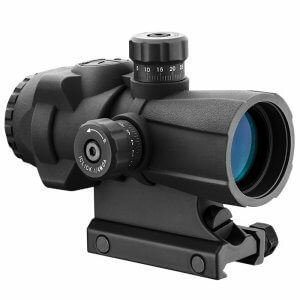 The 4x32 AR-X PRO Prism Scope by Barska is an innovative prism scope that was designed for law enforcement and military applications. A tough rubber armor exterior helps protect the AR-X PROfrom shock and external damage while a newly designed Illuminated Cross Dot Reticle allows for quick pin-point targeting. The color and brightness of the Cross Dot Reticle can be easily changed from red, green, or blue using a push-button design, which allows the user to quickly adapt the scope to the current lighting environment. The 4x32 AR-X PRO also features external 1/4 MOA windage and elevation knobs that can be quickly returned to zero. 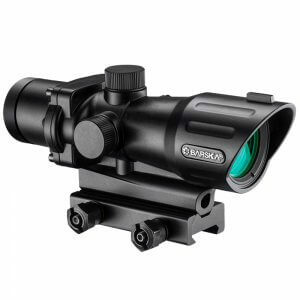 The 5x40 AR-X PRO Prism Scope by Barska is an innovative prism scope that was designed for law enforcement and military applications. A tough rubber armor exterior helps protect the AR-X PROfrom shock and external damage while a newly designed Illuminated Cross Dot Reticle allows for quick pin-point targeting. The color and brightness of the Cross Dot Reticle can be easily changed from red, green, or blue using a push-button design, which allows the user to quickly adapt the scope to the current lighting environment. The 5x40 AR-X PRO also features external 1/4 MOA windage and elevation knobs that can be quickly returned to zero. The 4x30 Electro Sight Tactical Multi Rail Riflescope from Barska is designed with the versatility in mind for both short-distance, quick acquisition and medium to long-distance shooting. 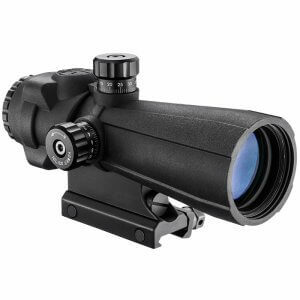 The riflescope has been endowed with multiple Weaver style 7/8" Picatinny rails for attaching aiming accessories such as a laser sight or a flashlight. There are side and top rails, windage and elevation turrets, an adjustable rheostat and an illuminated Mil-Dot reticle. The reticle is red or green - user selected - or just non-illuminated black. The CR2032 battery is included. It has a 30mm tube diameter and 1/2 MOA click values. 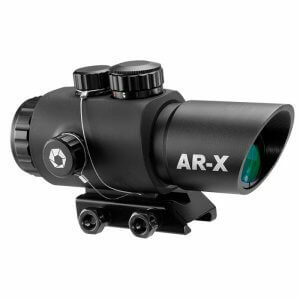 The AR-X 3x30mm Red/Green Prism Scope by Barska features an illuminated Mil-Dot IR reticle patterns, which can be set to five different levels of brightness with the adjustable rheostat. Features a protective rubber armor, flip-up scope caps, and attached retaining cable for the windage and elevation caps. This dot scope is equipped with a standard 5/8 mount that will fit a rifle's standard Picatinny Rails. Powered by included 3V lithium battery. The 6-24x50 IR 2nd Generation Sniper Scope by Barska is a versatile tactical scope which will perform excellent in a variety of targeting situations. A built-in sniper edged sun-shade is set back in the housing, which allows the sun shade to reduce glare for use in bright sun. 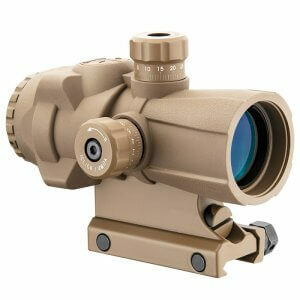 Multi-coated optics give the 6-24x50 Sniper Scope a sharp, bright image with excellent contrast. An illuminated red and green mil-dot reticle greatly enhances targeting in low-light situations with 5 levels of brightness. Also includes protective scope cap and a set of rings. Backed by Barska's Limited Lifetime Warranty. The AR6 1-6x24 IR Rifle Scope by Barska has been developed to provide a solid short to mid-range tactical scope that allows for quick target acquisition. 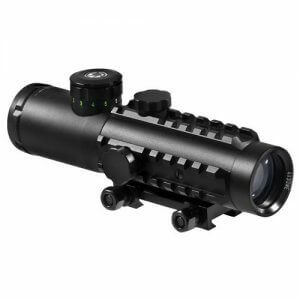 This scopes versatility is further enhanced by the addition of a red and green illuminated Mil-Dot reticle, which provides targeting visibility in low-light conditions. 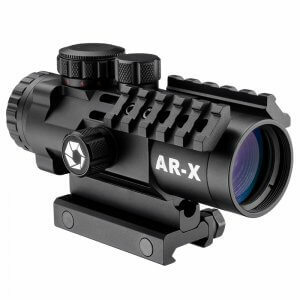 The AR6 1-6x24 IR comes equipped with a 30mm cantilever scope mount and flip-up scope caps.